Bright, healthy smiles start young. That’s why we love caring for kids’ teeth. Our team of dental professionals focuses on providing preventative care along with education on oral hygiene. Children who practice good oral hygiene habits such as brushing at least twice a day, flossing daily and visiting the dentist for regular checkups can enjoy a healthy smile for a lifetime. Our kind and caring dental hygienists love working with children. During your child’s gentle cleaning, they will discuss the importance of good habits like tooth brushing for two minutes at a time and showing them other ways to keep their smile sparkling. The deep grooves and pits of the back adult teeth (molars) are at a higher risk of accumulating bacteria and therefore are some of the first areas where decay will develop. Sealing these vulnerable areas off makes these teeth easier to clean daily. Routine evaluations are essential to monitor your child’s oral development and detect concerns or problems in the earlier stages. Identifying cavities or dental decay at an early stage is particularly important in our youngest patients. 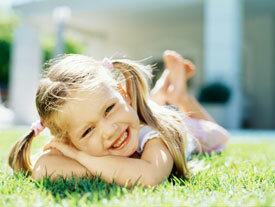 We recommend that you bring in your child for regular visits from 12 months of age. Because stronger enamel is more resistant to decay, a fluoride application is recommended for children. Fluoride also can reverse early demineralisation in teeth. While helmets and padding offer protection while playing contact sports, another piece of equipment is recommended: a sports mouthguard. These custom-made oral appliances can safeguard the teeth, helping to reduce the risk of dental accidents and trauma. By monitoring your child’s bite development, we have an opportunity to offer interceptive services, potentially eliminating the need for more complex and costly treatments in the future. We look forward to helping your child achieve and maintain the healthiest smile possible. Contact us today to schedule an appointment. We accept the Child Dental Benefits Schedule.